Brainteasers aren’t necessarily everyone’s go-to choice for killing a few minutes on the iPhone, but Think—from Ravensburger Digital — might change your mind about that. 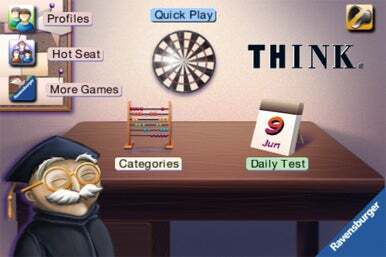 Think boasts 16 games in four categories targeting different cognitive skills. The "Reckon" category is full of simple math drills, "Comprehend" includes brain benders like Color Sudoku, "Memorize" tests your photographic memory skills, and "Think" rounds it out with reasoning puzzles. There are many fun minigames here to enjoy, but "Up and Down!" is one of the best. 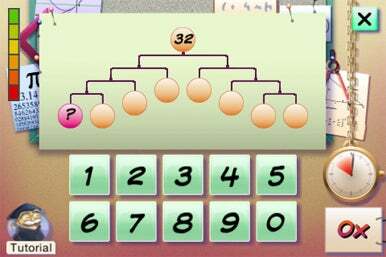 The object is to arrange numbers and letters in ascending or alphabetical order. It's much tougher than it sounds. In contrast, Numbers Mobile tasks you with inputing a number to keep the mobile balanced—it's a great exercise even for a math-phobe like me. All of this takes place in an adorably cartoonish classroom setting with Albert, your cap-and-gown-clad Einsteinian host. If at any point you’re not sure what to do, give him a tap and he’ll spit out information about your stats or how to play a certain game. If you’re feeling indecisive, the Quickplay option will select a random game for you to try out. The Daily Test compiles a series of games for you to play. This section also stores high scores and worldwide statistics for comparison with other players. The app also features a turn-based multiplayer option called Hot Seat, so you can play with up to four friends by passing your iPhone, iPod touch, or iPad around. Your friends or family can even create their own profiles for the app as well. Four players can enjoy the action at the same time. Think somehow manages to be challenging and relaxing at the same time, with endless replayability and a perfectly reasonable $3 price tag. Whether it can actually “strengthen your gray matter,” as the developer claims, is difficult to say, but you sure do feel smarter playing it.